Tara hates savoury couscous that has fruit like raisins in it, but i think that sour cherries are the answer. They bring a similar morrocan feel to dishes, but are much less sweet. - Pour 450ml vegetable stock in a pan and bring to the boil, add salt. - Mix 350g couscous with 50g sour cherries, 1/2 teaspoon each of cinnamon and cumin, then add the pan of stock and remove from heat. 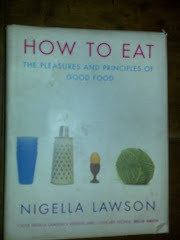 - Heat a tin of chickpeas, and when the couscous has absorbed the stock, add the chickpeas, then stir in 30g butter. 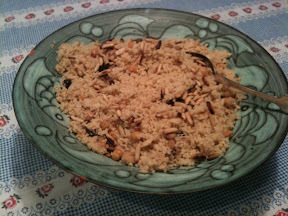 - Toast 60g pinenuts, add half of the couscous and sprinkle the other half over the top when serving.